Researchers led by a UCLA bioengineer have developed a therapy—based on two types of cells joined into a single unit—that could help strengthen existing treatments for acute myeloid leukemia. One of the cells is a blood platelet that carries a drug that attacks cancer cells; the other is a stem cell that guides the platelet into bone marrow, the spongy tissue inside bone where new blood cells are made and where leukemia begins. As a treatment for leukemia, chemotherapy on its own is only moderately effective: It fails to go into remission in about 1 in 3 patients following chemotherapy, according to the American Cancer Society. And about half of people with disease who do experience remission initially may have a relapse—typically within two years after treatment—usually because some cancer cells can take shelter in bone marrow, where the chemotherapy can't reach them. The UCLA-led research aimed to solve that problem by devising a method to deliver medicine directly into the bone marrow. Their approach, which they termed "cell combination drug delivery," is the first to link two different cells together for therapeutic purposes. 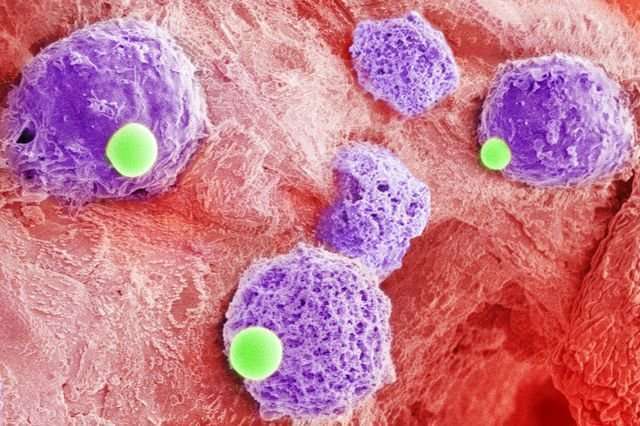 In the combined cells, the blood platelets are used to deliver immunotherapy drugs called checkpoint inhibitors (the UCLA researchers used a drug called an aPD-1 antibody), which seeks out cancer cells and neutralize their defenses. Once that happens, the body's immune system can "see" and destroy the cancer cells. The second element of the two-cell combination is a hematopoietic stem cell. Hematopoietic stem cells, or blood stem cells, can find their way into the bone marrow through specific chemical signals—an important ability for the study because cancer cells could be located anywhere in the body.